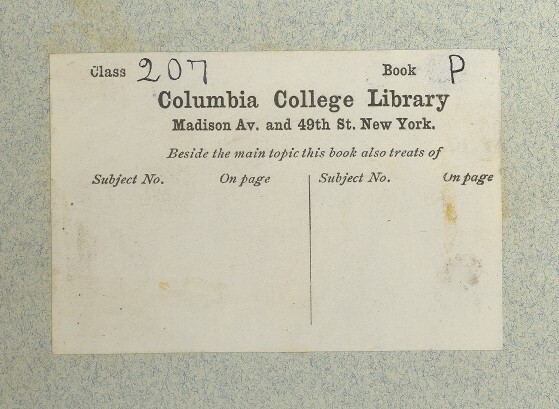 Serial number 31653, undated, cataloged during Melvil Dewey's tenure as librarian. Cataloging on bookplate inside front cover. This book, Catalog of Princeton Seminary, still bears its original classification. Class 207 is Religion: Study and Teaching. The Book is simply P for Princeton. The Book appears to have been changed by erasure from CP or just C although the spine label in gold leaf shows no sign of change. The lower part of the plate provides for Dewey Decimal subject entries for parts of the book. Plates with entries in this portion are very rare.